A Birman is an extremely beautiful semi long haired cat. They come in twenty different colour patterns from solid through tortie, tabby and tortie tabby points. 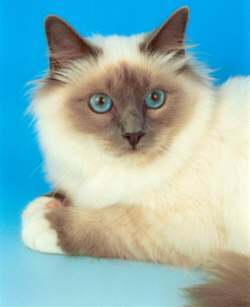 The Birman points are the mask (face), ears, legs and tail with a pale toning body. Birmans have almost round deep blue eyes set in a broad head with well spaced medium size ears, the nose is medium in length with a slight dip in the profile. The body is long and massive with thick set medium legs and, the breed characteristic, four pure white paws known as the gloves (front feet) and the gauntlets (hind feet). Another characteristic is the Birman huff, which is a noise they make to show displeasure. Birman coats are easy to managed and dont require to be groomed daily. Once a week is fine and most Birmans enjoy this. Birmans are affectionate, gentle, very laid back, and love human company. They are very intelligent and easy to train, very curious and will follow people around the house taking great interest in anything that is going on. The Birman colours are: Solid points: Seal point, Blue point, Chocolate point, Lilac point, Red point, Cream point Tortie points (always female): Seal tortie point, Blue tortie point, Chocolate tortie point, Lilac tortie point Tabby points: Seal tabby point, Blue tabby point, Chocolate tabby point, Lilac tabby point, Red tabby point, Cream tabby point Tortie tabby points(always female): Seal tortie tabby point, Blue tortie tabby point, Chocolate tortie tabby point, Lilac tortie tabby point.